A man who is suspected of being involved in a hit and run accident that resulted in two critically injured victims is in custody. The suspect, 22-year old Gurdeep Sighu (pictured above) turned himself into Sacramento Police. 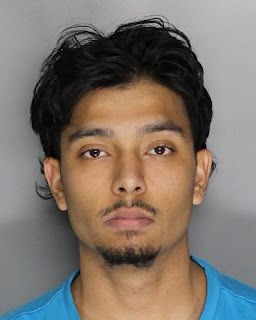 Sighu was allegedly involved in the incident that took place yesterday at at approximately 3:24 p.m., near Freeport Boulevard and Oregon Drive. When officers arrived, they located two pedestrians, in the roadway, with injuries. Officers immediately began life-saving efforts and were relieved by the Sacramento Fire Department. The 71-year-old female pedestrian and 6-year-old male pedestrian, who sustained injuries as a result of the collision, were transported by the Sacramento Fire Department to a local area hospital. Both pedestrians are in critical condition. Officers conducted an initial canvas of the area for witnesses and evidence. Due to the severity of the collision, the Department’s Major Collision Investigation Unit (MCIU) responded to the scene to take over the traffic investigation. Investigators checked the area for additional evidence and witnesses. Preliminary information suggests that the vehicle was traveling northbound on Freeport Boulevard. When the vehicle approached Oregon Drive, the vehicle collided into two pedestrians. The vehicle continued northbound on Freeport Boulevard and did not stay on scene. During the course of the investigation, Sighu identified himself to police and turned himself in. He was arrested for felony hit and run and remains in custody at the county jail. No Comment to " Suspect Turns Himself in to Sacramento Police in Hit and Run Incident "